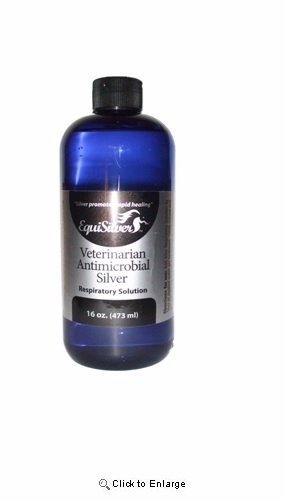 EquiSilver Respiratory Solution is an exclusive patented veterinary formula containing chelated silver. This ingredient has been shown to kill hundreds of different infectious microorganisms. EquiSilver’s Respiratory Solution is a 100% safe and non-toxic. Kills microorganisms within 4-6 minutes by preventing the uptake of oxygen. Helps clear up upper sinus and lower bacterial lung infections in horses when used in a nebulizer or transpirator. 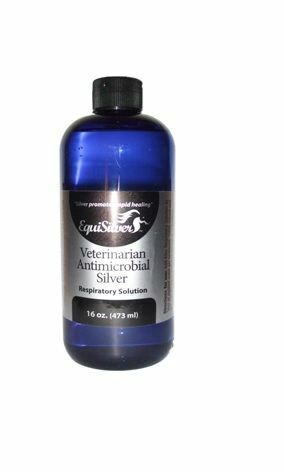 EquiSilver will not interact with other medicines and unlike antioniotics, microorganisms cannot mutate to silver resistant strains. Regular use helps with infections such colds, coughs, heaves or bleeding due to poor oxygen intake or fermentations due to various bacteria, viruses or fungi. For equine use only. Always check with your vet before using new products on your horse.